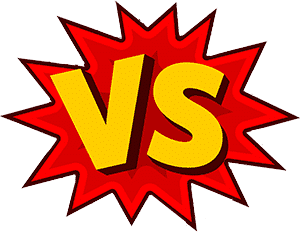 Weathertech vs Husky: Which is better? The best and easiest way to keep your car carpet clean is to cover it with the best car floor mats. You may accidentally spill a drink in your car or truck in mud when Mother Nature deals you some heavy downpour. You have to admit that there is no worse feeling than to be walking around in mud or snow only to get in your car with chunks of dirt that get stuck on your floor. Not to mention the headache of having to take your car to the carwash when it doesn’t suit your budget. While you may have no control over these things, you may at least get a good floor mat for your lifestyle and car. 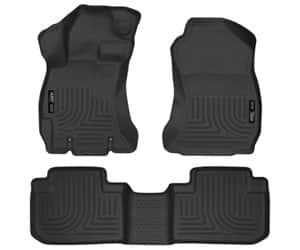 And what better floor mats are there for a well-kept car than Husky Liners and WeatherTech which are leading companies in the manufactory of floor mats? Our review is going to involve a face-off between WeatherTech and Husky Liners, and we will pick out individual products from each brand, and compare them. Hopefully, you will get the ultimate buyers guide for the best floor mats in the industry. 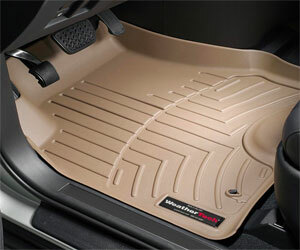 WeatherTech is a famous floor mat brand that is designed and manufactured in the United States. WeatherTech uses top tier laser measuring tools to ensure that the mats fit every contour of your vehicle with utmost precision. Also, they use semi-flexible, heavy-duty rubber to ensure that the mats are durable. Their line of color liners features custom designs for your car type and all-weather universal designs that can be trimmed down to a perfect fit. 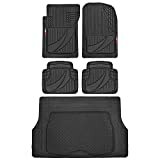 WeatherTech floor mats have a rubbery feel and an anchoring system that offers better positioning for the mats as opposed to using cleats to prevent slipping or uncontrolled movement. They are made from High-Density Tri-Extruded material that provides a robust, rigid core in addition to a gripping surface. These mats are smooth on both sides and therefore makes installing them easy. WeatherTech mats can also hold their shape for years. WeatherTech utilizes raised edges and a reservoir system to channel spills and dirt from your car floor. The raised edges also create an anti-slip tactical surface that limits accidental slips. The floor liners are laser scammed and engineered for an exact fit for each vehicle. As long as you confirm that the mat is a precise make for your car model, then you are guaranteed that it will fit like a glove once you install it. Additionally, WeatherTech mats are waterproof which makes them ideal for winter conditions when the snow melts inside your car. No one wants to have ice melting on their floor carpets. What you will love about the product is that it is available for both the front and back of your vehicle. flexible, temperature resistant, and wear resistant and provide maximum grip and stability. A limited lifetime warranty covers this product. Don’t fret if you notice manufacturing faults with the floor liners. You will get a replacement or your money returned when you take the issue up with your retailer. WeatherTech will forever remain on people’s wish lists due to its ergonomic design, quality, aesthetics, and durability. You no longer have to worry about your children or dog slipping in the car when it’s snowing. You also get peace of mind knowing that the front and back floors are well protected. WeatherTech floor liners are the best Christmas/birthday gift to get your spouse. It is not a matter of brand recognition but getting the best product the industry has to offer. And the WeatherTech floor liners are the best. It may be a bit on the pricey end, but you should prioritize quality over cost. Husky Liners is a Kansas, USA based establishment that researches, plans and manufactures high-quality floor mats suitable for trucks, cars, vans and also makes the trunk and cargo liners. Husky Liners was birthed as a business entity in 1988 with the primary goal of offering protection to your car’s floorboard. For starters, Husky Liners floor mats are known for being easy to install and clean. You only need to take them out and quickly hose off the mud, and you are good to go. What’s more is that the set is available in multiple colors (black, grey or tan) and you can replace the cleaned set with a new one for a new look. Husky Liners floor mats are made from a custom thermoplastic which makes the mats resistant to wear and tear and also features raised external walls and grooves that keep messes away from your carpet. Dirt and spills are channeled from the raised edges into the lower reservoir containment where you can clean them off quickly. When it comes to construction, these mats have spikes (STA-Put Nibs) on the underside which is both good and bad. Good in that the spikes prevent the mat from slipping and uncontrolled movements when you step on it. Bad in that the spikes go all the way up to the raised edges and can scratch the plastic on the trim of your car. The spikes also make it somewhat difficult to install over a fluffy carpet and may also damage it. The Husky WeatherBeater line is durable and rugged. It also has a soft exterior that is boot proof and muck resistant. The fabric is resistant to the damaging effects of harsh chemicals like gasoline and extreme temperatures. Specially designed retention systems on the left and right side if the mat fully adapts to your vehicles contour for a secure fit that leaves no unsightly bumps. Husky is the best WeatherTech alternative that comes with just as good features and at a lower cost. The floor liners conform to the design of your car floor and the fact that the set comes with both front and the 2nd seat cover is a bonus. Talk about maximum protection for your car. Husky vs WeatherTech: Who wins this? WeatherTech takes the trophy home with this one for one simple reason. It’s classy. You cannot beat the polished look that comes with WeatherTech floor mats, and it’s hard to return it when you hold them up against the somewhat regular looking Husky. But we have to admit that Husky would be a great choice if you are looking for something decent looking that comes at a lower price than WeatherTech. Husky Liners also come with a design that is more suitable for rugged trucks. 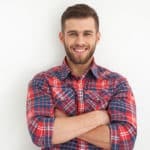 Both mats, however, share some similarities in that they are sold directly by the companies, through lines of partners and distributes and are also located in online stores like Amazon. They also bagged 4.5 stars in customer ratings so you can never go wrong with both. However, there is a catch. The car mats may not fit your car model. It is better to search the mats by the specific year, make and model of the car to get a custom fit and avoid ugly trimmings. Our bonus selection for our review is a product by Maxliner. Maxliner is a manufacturing facility that has its headquarters in Orlando, Florida. The central manufacturing plant for its products is located in Thailand with subsidiary development centers in South America. They are known for using state-of-the-art facilities, designs and manufacturing technologies to produce the best floor mats and liners for every car, truck, and SUV. A unique feature about Smartliner mats is that the manufacturers used eco-friendly, flexible and low-density polyethylene material to make these mats. The mats come as an exact fit for your vehicle and have a lifted Spill Saver Lip and molded outer edges to channel away dirt and spills from your car carpet. Smartliner provides all-weather protection against sand, mud, water, and snow that could make your car feel uncomfortable. The thing with recycled materials is that they give off this tire shop smell when new. Well, that is not the case with our Smartliner front and rear mats. You will not get any weird odors from this mat even when it gets hot in your car. Plus, once you lay out the mat, you will notice that it has a chic design, reinforced but flexible material, and exquisite fitment work. It is easy to install and yank off the mats for cleaning. What’s more is that the mats do not show any wrinkles or creases as you fit them in your car and the folds from the packaging even out on a warm day. Smartliner is a modern design mat that improves the interior look of your vehicle with its textured skid resistant surface and polished look. The Smartliner floor liner kit is an excellent deal for a pocket-friendly price. You get both front and rear seat coverage that are an exact fit for your vehicle. They also look pretty good, well built. The fact that Smartliner is a product of post-consumer recycled material sits well with the eco-friendly at heart. The packaging is also commendable as everything comes in a single box, individually wrapped and protected. The mats also bounce back quickly when unfolded. What are WeatherTech floor mats made of? Is WeatherTech made in the USA? 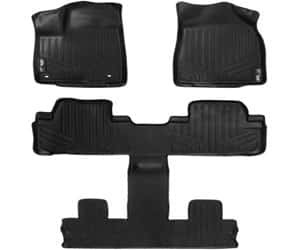 How do you keep WeatherTech mats looking new? Are Husky Liners better than WeatherTech? Are Husky Made in the USA? Where are Husky Liners made? WeatherTech floor mats are made from tri-extruded high-density material which is resistant to harsh weather and is damage proof against pets. The material is advanced, OEM approved rubber-like Thermoplastic Elastomer (TPE) compound. It is odorless, latex free, contains no harmful PVCs, lead or cadmium. The TPE material is also 100% recyclable and eco-friendly. The material is manufactured in government compliance of ISO 9001 standards and also meets FMVSS302 standards for assurance of quality and your safety. WeatherTech floor mats and car liners are designed and manufactured in the United States at Bolingbrook. If you find it impossible to keep the mud and other dirt from your vehicle, then you ought to regularly clean the mats to maintain that new look you love. If you have a garden hose, WeatherTech mats are easy to clean with just a spray. You could also throw them in a bathtub and use a mild detergent and soft bristle scrubber to get the dirt off. Always remember to also remove the mats from time to time and give them a shake to prevent wrinkling and to also aerate them. Husky products are cheaper than WeatherTech, but the latter always gets better customer reviews in as far as durability, how good the product looks and quality. WeatherTech also stands out in that they use digital fit technology that ensures that the mat is always a perfect fit for your car. Yes. Husky floor mats are exclusively made in the United States with a custom fit design for every car no matter its year, make or model. Husky liners are manufactured in Winfield, Kansas and are designed to protect your vehicle both inside and out. If you are always working on a busy schedule, regularly spill drinks in your car and have children and pets who make your car a mess, then you should get floor mats. You may never have enough time to clean your car, but at least you can keep the dirt and prevent the permanent stains from getting on your ride. Take the leap and make your car floor neat, clean and smart by going for any of the car mats in our reviews. They have been vetted by the best, and you are guaranteed nothing but quality and value for your money.